This post is about people, more specifically about people who energize you and get you excited about your work and life even when you meet them for the very first time. The post itself is coming a week late, but I am happy that I at least kept the promise that I had made to myself about writing a post every week. I wrote most of this post last weekend; I just could not publish it then because I didn’t have access to internet. First, the hotel I was staying at in Nairobi lost internet connection for three days, supposedly due to some problems in the fiber optic cable. And then after reaching home in India, it took me a few days to get internet installed at my home. So yes, last week I was in Nairobi, Kenya to present a paper at the African Academy of Management (AFAM) conference that I had written in collaboration with my former student, Dr. Saneta Maiko, who is now a researcher at Indiana University Health, Indianapolis. Our paper was received extremely well, and spurred a lot of discussion. My presentation of 20 minutes was followed by over 30 minutes of Q&A. If you are familiar with the formats at most academic conferences, it is pretty rare to see the Q&A go for such long period. So I was gratified to see the enthusiasm around our paper. If you are curious about our paper, it discussed a non-traditional approach of teaching ethics to management and leadership students by helping connect the students with the community and environment so that the students start caring about them. Anyway, I am digressing here, because I want to primarily talk about some of the very cool people I met at the conference. I always love presenting at international conferences, not just because one gets to visit some new places but also because one gets to interact with and learn from scholars from different corners of the world. I have met some very cool people at these conferences, a few of whom have gone on to become very good friends in my life. At the AFAM conference also I had the opportunity to interact with some very knowledgeable and warm people. I won’t bore you by giving a detailed narration about each one of them, but I would like to share about two people who made strong impression on me. "I just want to say that I felt such an ethics of care from you." Another person in the audience joined in, "Exactly!" The second person I would like to talk about is Dr. Sue Canney Davison, a British-born, Oxford University graduate, who has settled down in Kenya after marrying a Kenyan. Incidentally, she spoke fluent Hindi as well because of having lived in Himanchal Pradesh for over a decade during her twenties. Sue had some excellent suggestions on our paper as well, and also recommended a book published from Africa that she thought would be beneficial while I worked on developing my paper. But those aren't the reason I am talking about her here. The reason she made an impression is because I ran into her again at the closing ceremony of the conference. She excitedly said that she had brought the book that she had recommended to me the previous day so that I would get a chance to look at it. That's how I did get a chance to browse through that book. Since I was leaving the next day (a Sunday when all major shops are closed), she even offered to buy and send me a copy of that book because it would be difficult for me to find that book outside Africa. Now that's a clear sign of a person who really cares. Lastly, a few words about Kenya. I was there for just three and half days. So I didn’t really visit much of Kenya. My initial intention was to spend at least a week to 10 days in Kenya, go on a long safari tour and climb Mt. Kenya. But then I had to change my plans to attend to some family emergencies at home. But I hope to be able to come back to Africa again to fulfill my dream of climbing Mt. Kilimanjaro/ Mt. Kenya, go on a safari tour of the Maasai Mara National Park, and if time coincides, even run a marathon with the Kenyans. 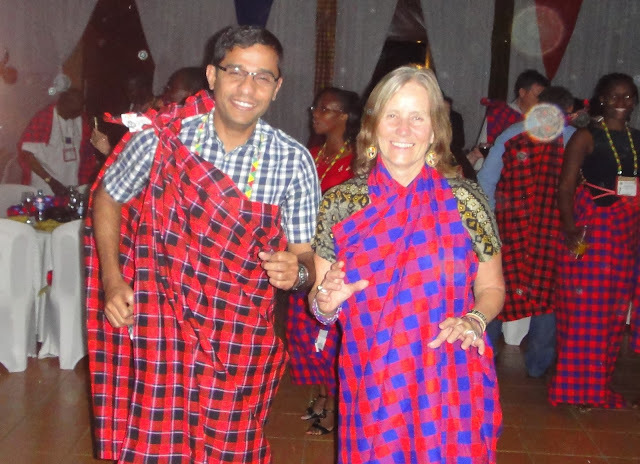 Ready for a dance in the Maasai attire at the closing ceremony of the African Academy of Management conference. Thanks to Sam (the person next to me) for helping me put on the attire!